With those kinds of benefits, I feel like I should bake loaves and loaves of this bread for all my loved ones. This loaf will be shared with family later this week, so I will write this post solely about the baking of it for now. According to the author, this is a great bread for sandwiches, or for serving with soups and stews. 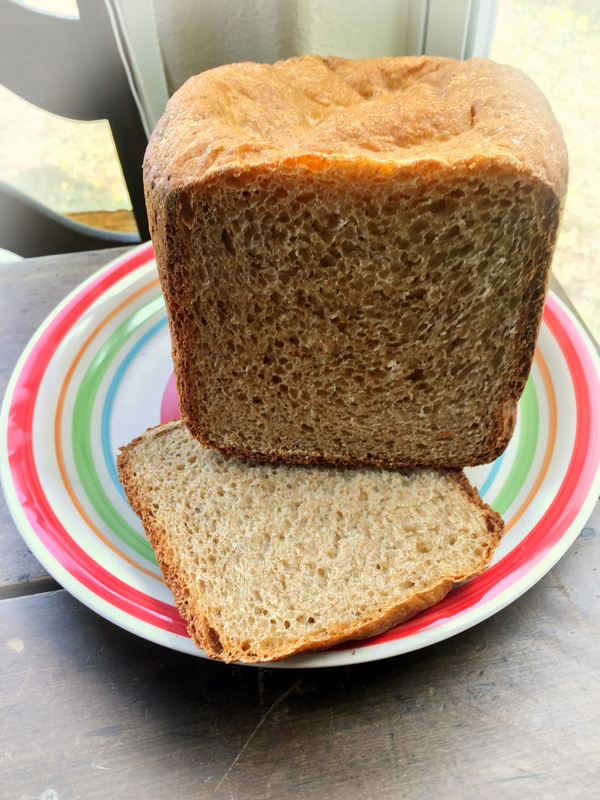 Ingredients went into the bread machine pan in the following order: 1 1/8 cups water, 2 tablespoons canola oil, 3 tablespoons honey, 1 teaspoon salt, 2 cups bread flour, 1 cup whole wheat flour, 1/4 cup nonfat dry milk, 2 tablespoons flax seed, 1 tablespoon gluten and 2 teaspoons SAF yeast. This recipe recommends the medium crust and whole wheat cycle settings on my machine. I just finished baking my last loaf with starting this one, so after washing out the pan, and adding the ingredients, the machine was still not quite cool enough to start again. I didn’t realize that it ne eded to cool, but when I tried to start this loaf, it beeped and gave me an error code. I waited a total of 10 minutes and tried again, this time the cycle started, but now I know to let the machine cool a bit between loaves. This loaf baked up nice and high with a lovely brown crust; it smells delightful. It smells so good, I wish it was something I could try for myself. I will come back to this post and add my taste testers’ thoughts later. Thanks to the staff at Steamboat Animal Hospital, for taste-testing for me.